When most people hear the title “Legally Blonde” they jump to thoughts of the 2001 American comedy film based on Amanda Brown's novel of the same name. It starred Reese Witherspoon, Luke Wilson, Selma Blair, Matthew Davis, Victor Garber, and Jennifer Coolidge. The story is about Elle Wood who has it all in her life except one thing. The man of her dreams. She is a sorority girl who wants nothing more than to be Mrs. Warner Huntington III. But there is one thing stopping it. She is too blond. Elle rallies all of her resources and gets into Harvard in an attempt to win back her ex-boyfriend by getting a Juris Doctor degree. The title is a pun on the term "legally blind". Lauren Fuoco with cast from “Legally Blonde”. The story has expanded past that original movie into a play format and then in February 2007, a musical adaptation of Legally Blonde premiered on Broadway. It had mixed reviews overall. But that has not stopped the production from finding success. The play version, as well as the musical version, have gone on to be done in various High Schools in North America. Including a few in London and area. The production was done at the Grand Theatre in 2013 for the 15th anniversary of the High School Project. Then in 2014 in Chatham, Ontario at the Chatham Capital Theatre. For that production which was the musical version, iFilmGroup member Lauren Fuoco from Chatham played the lead role of Elle Wood. “Playing Elle was the first experience I had playing a real lead role. I was honoured to have been picked” says Fuoco. She says the role was a lot of hard work and dedication. “It takes a lot out of you. I had to be at every rehearsal and had my own private rehearsals outside of the regular ones. I was constantly singing the songs and running through lines. Before bed, I would run through the scenes in my head as I fell asleep. By the end of it all, any members of my family could have been the lead because they heard it 24/7”, adds Fuoco. In the end, the production itself turned out amazing. Unfortunately, there were some things that they had to cut out for time purposes and to make it more appropriate for the kid’s shows. But that did not take away from the experience for Fuoco. “Overall it was so awesome! I would do it again in a heartbeat. You get so close to all your cast mates that you feel like a family. I miss doing the show all the time” says Fuoco. Fuoco has been working with iFilmGroup since late 2018. She is newer to the group but is looking forward to working with them more once the school year is out and she is done her university term. She was a part of “Blue Love” as the character of April Anderson a waitress that has gone into labour and who is in the maternity ward at the same time as the films lead Kaitlyn. Lauren is also auditioning for the upcoming iFilmGroup production of “Not Ready”. 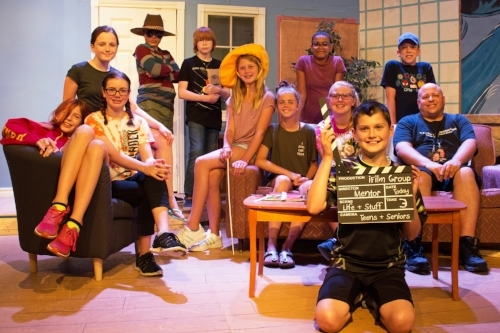 Another connection to the show and iFilmGroup comes in the pre-professional program at Drayton Festival Theatre. They are doing “Legally Blonde Jr” in 2019. Shelby Simpson audition for this pre-professional program. Her audition for Legally Blonde came out of her auditioning for the summer musical theatre acting camp at Drayton in the spring of 2018. Thus far she has not heard back from her audition for Legally Blonde or if she got a role. But Simpson considered the experience “awesome” regardless if she gets a role. Simpson has been an active participant in the iFilmGroup workshops and activities. She plays a role in “Blue Love” and was part of the Drama Therapy footage shot with iFilmGroup. She is also auditioning to be part of an iFilmGroup’s movie production “Not Ready”. Parkside College Institute performed the musical version of the show in late February, early March of 2019. Parkside is iFilmGroup co-founder, Matthew Marshall’s old high school. Marshall attended the production and found it very good. “For a funny little show it has a bigger message about keeping it positive,” says Marshall. Marshall felt the cast did a great job in bringing the story to life. The play has an important message about breaking down stereotypes to prove we are more than what people assume we are. Marshall feels that is a message that people need to hear. Especially the younger generation, which is our future. Parkside’s production features some cast members that are both newer faces as well as a familiar face to the iFilmGroup community. The new faces are Haley Gordon who in the play, plays the role Serena. Gordon has worked with the iFilmGroup production team in “Blue Love” where she had a small role. She is also auditioning for “Not Ready”. 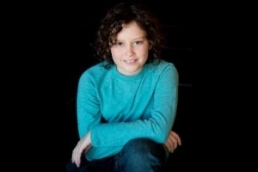 Adam (AJ) Longlade is playing the lead male role of Emmett Richards in Parkside’s version of the play. Longlade has applied to “Not Ready” and is interested in participating with iFilmGroup. The familiar face of the play was Aaliyah Paul who played Gaelan and was part of many of the dance numbers. 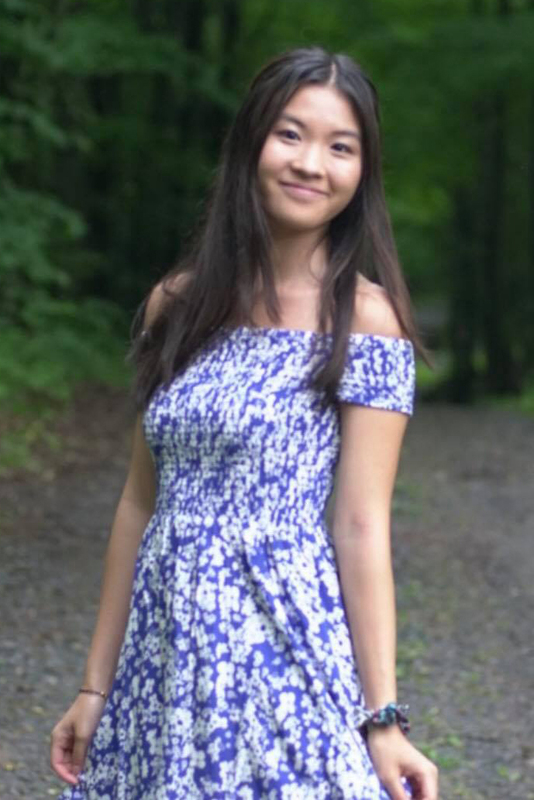 Paul is known for her roles in Marshall’s bullying film “Malicious Attack” as the reporter and in “Summer of Discovery” where she plays the role of Becca the best friend of the lead. The story of Legally Blonde is sometimes fluffed off as just a silly and goofy one, but the deeper message of not judging a book by its cover and achieving your full potential is one that iFilmGroup stands behind. It is what the iFilmGroup team is trying to do within their mandate of mentoring its members. They want each person involved to be the best they can be, discover the many wonderful and interesting aspects of film making. While also forming lasting connections and relationships across generations. With the newest production- “Not Ready” in the pre-production stage, the team will explore the themes and topics of the value of life and relationships within this newest production. They are currently gathering acting resumes and headshots for auditions which are coming up. Look for more information in the near future about this production. 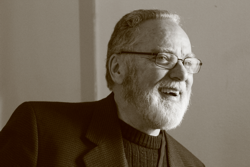 Matthew Marshall; guest presenter at the Stanton Academy, London, Ontario. 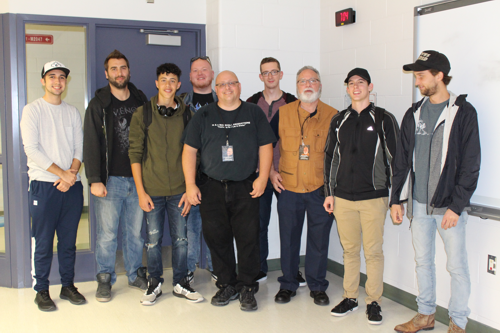 Award-winning film director and iFilmGroup co-founder Matthew Marshall was the guest presenter at the Stanton Academy in London, Ontario. 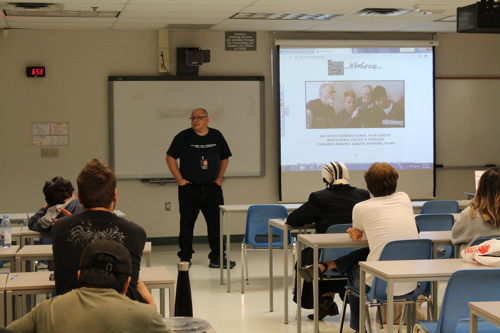 He spoke to a group of students from the Academy about film making and the iFilmGroup. The students are working on small film projects either on their own or in small groups. Many are focusing on stop motion animation while others are working on scripts, short films, and trailers for film ideas they have. Stanton Academy is a responsive learning environment committed to the emotional, social, and intellectual needs of children in our community. They offer unique opportunities for home-schoolers, for bright and gifted children, and for everyone looking for an authentic and personalized learning experience. The two classes involved have been learning and studying about film and film making. The group have been viewing samples of movies and brainstorming about what they want to create. They are working on simple storyboards and scripts with the end goal of making a short film or trailer for their movies. Marshall spoke to the group in two one hour sessions. He talked about his career in film making and what goes into making a short film. He also discussed iFilmGroup and the inter-generational film making the group does. At the end, the group talked about their ideas and concepts about what they are interested in doing for their projects. Marshall offered suggestions and advice to help them along on their various film projects. The groups finished films will be done in a few weeks. Marshall is interested to follow up with the various teams and Stanton Academy and look at ways he and the iFilmGroup can further help promote these young inspiring youth. “The day offered me an opportunity to talk about film and mentor youth that are interested in film,” says Marshall. Mentoring is at the heart of the iFilmGroup mandate and Marshall feels it is important to mentor others after the many people that have mentored him. “I have had a lot of great people in my life that have taken me under their wing and mentored me to where I am now. I feel I need to “pay it forward” and mentor others in the same manner as what I received”, Marshall adds. Check back into iFilmGroup on their website or Facebook page for more updates on this and other projects or events that are in the works. iFilmGroup co-founders Matthew Marshall and Don Hickey are delighted to announce a new member to their award winning Production Team. Golden opportunities for all existing and future actors and crew members with the introduction of Angel Bilagot to our Production Team will enhance our acting workshops and teaching methods. The Western Smartphone Film Festival (WSFF) had another successful festival on Saturday, Feb 2nd at the Western Film Theatre on the 2nd floor of University Community Centre on the Campus of Western University. The event was the showing of the top ten films of the 2019 festival. The theme was “Perception verse Reality” and the ten finalist filmmakers did not disappoint as there were five of the ten films that were contenders for the top prize. Matthew Marshall, iFilmGroup co-founder was one of the WSFF judges of the event and he enjoyed the various entries and the creativity that went into the films by the various filmmakers. He was joined on the judging panel by Jordan Christopher Morris, an award-winning producer, and director of films like “Nintendo Quest” and multiple festival best documentary winner “Missing Mom”. He is the creator and host of Sighthound Studio. Jordon is also a committee member of the Forest City Film Festival. The third judge on the WSFF panel was Allen Saulnier who is the award-winning author and director. He is the founder of E11even Entertainment Studios. He has been writing, directing and editing films since 1989. 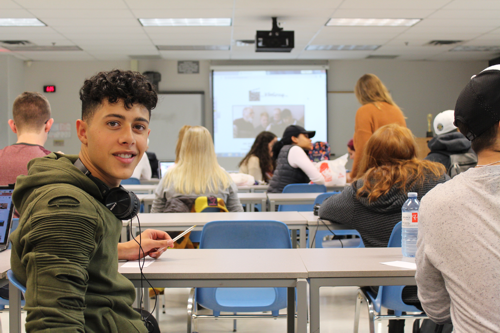 All films entered into the festival had to be produced, directed and edited by students who are enrolled in a recognized Canadian post-secondary institution. All film submissions must be created during the period between theme release and film submission and must be filmed on a smartphone of any brand. The Western Smartphone Film Festival is in its fourth year and is a student-run organization at Western that is focused on developing youth in the field of film and entertainment by means of an annual smartphone short film festival. With a focus on inclusivity and garnishing Canada's diverse and talented student population. The festival team uses a smartphone as a platform to allow a broad range of students to explore their creativity and further fuel their passion for the arts without the burden of expensive equipment. The top ten entries had a few familiar faces as part of the films. One of the stand out films “My Guardian Angel Only Wears Black” by Barry Tanner Bennett features lead actress Kelsea Crowe. Crowe is not directly connected with iFilmGroup but was part of the cast of Marshall’s award-winning 2014 feature film Daughter of the King. Crowe played the role Nadia. Daughter of the King won 32 awards, had 16 Official Selections, 3 nominations, and 1 finalist award. Crowe’s performance in the film is quite moving as the wife in the film. In the theme of Perception verse Reality, the story unfolds in a way that leaves it unclear till the end what has really gone on. Some very talented work went into the films editing that impressed Marshall very much. Bennett has studied advance filmmaking at Fanshawe College in London, Ontario and was the Director of Photography on another of the top ten films “For the Absured” by Antonio Martinez. “For the Absorb” also included some familiar faces to Marshall and the iFilmGroup. Both Ryan Mason and Max Steinberg were in the film. Ryan Mason played the abusive husband in “Blue Love” by Marshall and m & s Marshall Productions. Max has had a number of appearance in various films associated with Marshall and iFilmgroup. He is also an active member of a number of iFilmgroup events and workshops. The 2019 field had a lot of good films and some familiar faces were back with films that helped elevate the game and made for some tough competition for this year’s festival. The director of last year’s second-place film at WSFF, Matthew Downs had a new entry for this year. His film “Fatal” created waves last year and was in consideration for best film in the festival before being edged out by “Man in A Box” which won the festival as well as the audience choice in the 2018 WSFF. This year Downs’ brought his newest film "LoVeliness” which feature Ciarra Thompson. Thompson was also the star of “Fatal” last year. This year’s film brought an interesting take to the theme of perception verse reality. The film follows Thompson’s character after a recent break-up, @Abbaluvr58 (Thompson) has a new high-tech device installed in her eyes, which allows her to download an artificially intelligent new boyfriend (who just so happens to be a replica of her ex). Since WSFF began, the Universe City Productions team has never failed to submit a film. Last year, their film, "Toronto", won 3rd place! This year’s entry kept up the tradition. With a few familiar faces from last year, the team brought a new and fresh entry to this year’s theme with “Our Father’s Sins” by Mis Afgan Talpur. It is a story of a young man whose father's company destroyed the environment. His guilt for his father's actions consumes him. We see how he perceives the world that his father ruined and how a girl enters his life and helps him see the reality of the situation. Another outstanding entry to the festival came in a film from a group of Sheridan College students under the title of EMG Productions who came together to make a film called “Filtered” about two best friends walking home from a party only to be attacked by an unwanted follower. The entire film is told through the footage on a cell phone and when Marshall first saw the film he admits that he was not entirely in favour of it due to the film being presented in a vertical format verse tradition Horizontal. “The film broke the traditional rules of film, and as a filmmaker, it bothered me at first but then I started looking at it more closely. At its heart, the film embodied what the Western Smartphone Film Festival is all about. Because the films needed to be filmed on a smartphone this brilliant team thought outside the box and filmed their film in tradition smartphone format of perpendicular. The entire film is the viewer seeing the videos that are on the cell phone,” says Marshall. And true to the theme of perception verse reality, what you see, to begin with, is not the full story. “We see footage that gives you one perception of these friends having fun together. But the truth is something different” says Marshall. As the film moves forward you start to see footage that starts to possibly explain why two friends have been attached. And as we move forward each one of the video clips that reveal the new information is deleted. In the end, through the telling of the story, a new story is revealed. It was a story and style that spoke to all three of the judges for this year’s WSFF and it leads to “Filtered” being selected as the Best film overall at this year’s festival. The results were a surprise to the “Filtered” team as they felt they were up against a very tough field and they were happy to just be at the festival. The surprise of winning quickly lead to the happiness of the team. The film was produced by Scott Edward Morris and directed by Paula Ner Dormiendo. It features the cast of Taylor Jeanette Gaudon who played the role of Alanna and also has a connection to London Ontario. 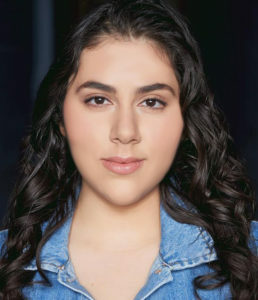 Karin Elyakim played the role of Cassie and Sabrina Solo played the role of Emily. The line at the end of the film spoke to Marshall and summed up the entire concept of the WSFF. The team thanked WSFF “for showing us that everyone holds a potential story in their pockets”. It spoke to the entire concept of the festival. After the final results were announced the three judges along with Dorothy Downs from the Forest City Film Festival made up a panel which the filmmakers and audience members got a chance to ask questions about film making and the industry. iFilmGroup congratulates all participants in this student run festival at UWO. Until next year… keep creating! The talented Talia Mielke has some big news that she just recently announced to the theatre/production community. She is thrilled to announce that she will be portraying the role of Dorothy Gale in Theatre Sarnia’s production of The Wizard of Oz! Talia is a newer part of the iFilmGroup family but has worked with iFilmGroup on a couple small projects as well as attended iFilmGroup workshops and having a small role in Blue Love as Maizie Dunne. Talia is a triple threat with experience in acting, dance, and singing. She has been involved with dance for 11 years with extensive training in Ballet, Tap, Jazz, and Contemporary. She is looking forward to moving on to post Secondary studies in a performing arts field. But before she does she will putting on the ruby slippers and looking to get back home as the lead Dorothy in the production of the Wizard of Oz which picks up when a tornado rips through Kansas. Dorothy and her dog Toto, are whisked away in their house to the magical land of Oz. They follow the Yellow Brick Road toward the Emerald City to meet the Wizard, and en route, they meet a Scarecrow that needs a brain, a Tin Man missing a heart, and a Cowardly Lion who wants courage. The wizard asks the group to bring him the broom of the Wicked Witch of the West to earn his help before the Wicked Witch of the West catches up with them. The show runs May 10th to May 12th and then May 15th to May 18th at Theatre Sarnia. This is her last show before she is off to school. She can’t wait to go over the rainbow with the amazing people that have been cast! Talia Mielke is no stranger to the Theatre Sarnia stage having roles in Cinderella, The Music Man, Mary Poppins, Beauty and the Beast, Oliver, and Legally Blonde. She also was involved with dance choreography with Theatre Sarnia as well as Sarnia-Lampton Rebound. Most recently she played Anne Shirley in Anne of Green Gables at the Petrolia Community Theatre. The iFilmGroup team held its third workshop of the year in conjunction with some still pictures and filming of footage for upcoming promotional and marketing projects dealing with Drama Therapy. The event took place at the Elgin Theatre Guild located at the Princess Ave Playhouse in St. Thomas and included various iFilmGroup member as well as some parents. The workshop / Production shoot was led by iFilmGroup Co-founders Don Hickey and Matthew Marshall. 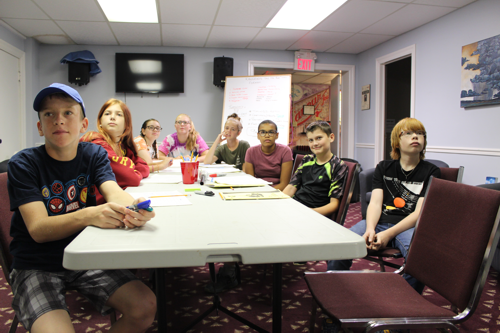 In attendance were some familiar faces included Max Steinberg, Shelby Simpson, Devynn Carver, Jacob Gagen, George Crosby, Talia Mielke, Petrina Cook and John Kakalas. The Drama Therapy focus comes after some interactions with a local Drama Therapist who wishes to work with iFilmGroup and partner with their mission to help youth and seniors on their life journey. The idea of Drama Therapy is the intentional and systematic use of drama and theatre processes to achieve healthy psychological growth and change. Action methods, spontaneous and dramatic play, drama games, mime, movement, voice, role-play, scripts, masks, myths, stories, metaphor, and symbolism are used to enable clients to express, experience and explore relevant feelings, emotions, and issues. The day included the use of masks and puppets as well as a dramatic expression to show emotion as well as techniques in expressing thoughts and feelings. All these elements were incorporated into the workshop component of the day as well as the photos and filming. The day also included an opportunity for friendship and interaction. Many social media connections were being made by the end of the day and friendships were most certainly formed. Both participants, as well as the iFilmGroup team, considered the day a huge success that created some very powerful images to be used in the future. Coming out of the workshop the iFilmGroup Production Team was impressed with the attendees and commits to cast them in future 2019 productions. The Western Smartphone Film Festival is back for the 4th year and soon will be wrapping up the official Registration period and then those registered will start the work on creating their films for this year’s festival. The Western Smartphone Film Festival is a student-run organization at Western University in London, Ontario that is focused on developing youth in the field of film and entertainment by means of an annual smartphone short film festival. With a focus on inclusivity and garnishing Canada's diverse and talented student population, the festival team uses a smartphone as a platform to allow a broad range of students to explore their creativity and further fuel their passion for the arts without the burden of expensive equipment. 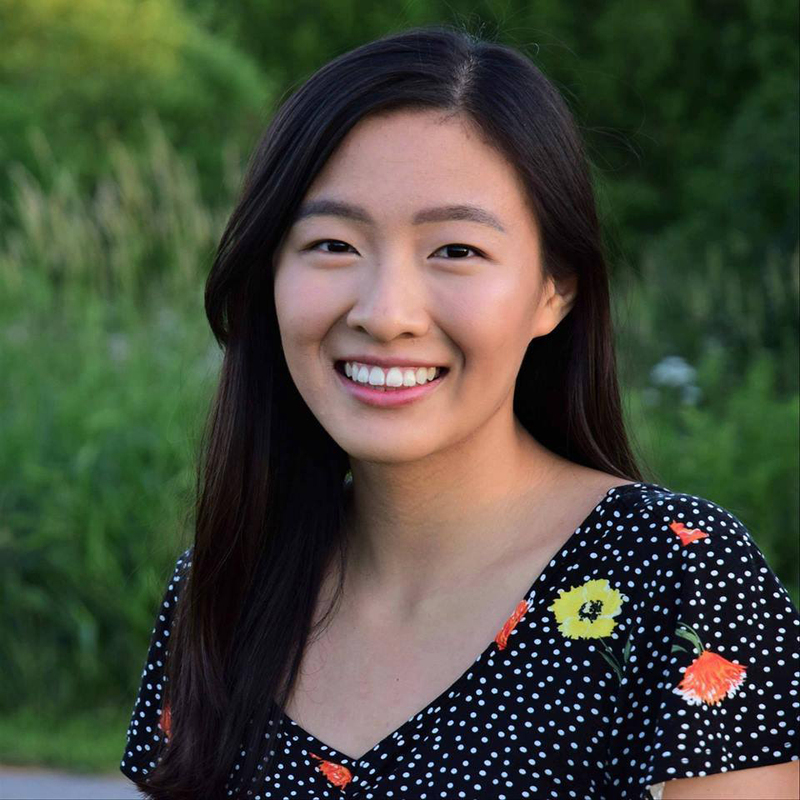 This year’s Executive Director of the festival is Renee Yik, a 4th-year student at Western University studying at the Ivey School of Business with an interest in the film and fashion industry. She is excited for the WSFF’s potential to inspire and cultivate a community of support, passion, and appreciation. “I’ve been a part of the festival for the past 3 years. Every year, I look forward to seeing the different and unique ways in which people interpret the theme and express themselves. Each film submission makes me so appreciative of the creativity and imagination that people hold. That’s why it’s so important to continue this opportunity for them to share their thoughts with their community”, says Yik. The 2019 festival committee team includes Sebastian Chavez (Finance Director) and Emily Shaw (Promotions Director) as well as a group of dedicated volunteers passionate about film. The mission behind the WSFF is close to the hearts of the iFilmGroup team. iFilmGroup strives to network youth and seniors in the making of award-winning films. As each person involved in the group of various generations brings their skills and talents to make meaningful films as they transition through their life journey. The group focus on mentoring and giving opportunities for both young and old to be able to make films. “When you have a festival that is organized and run by students and has films that are made with such passion as what is submitted to WSFF, it’s pretty impressive”, says iFilmGroup co-founder Matthew Marshall. Marshall had the privilege of being one of the judges for the 2018 Festival. “The level of talent and films were very high, as was the professions and work ethic of the organization committee that ran the festival”, Marshall adds. Marshall was blown away last year to see the high quality and immense creativity that came out of the films that were entered. The films were of such high quality it was hard for Marshall and the other judges to come to a final decision on the top three films, “it was a hard choice and took some real discussion on the part of the judging panel” says Marshall. He was also part of an industry professional panel which took questions from the audience and students about filmmaking. “Overall the entire festival was an amazing film experience that is worth attending”, says Marshall. He hopes the WSFF continues to grow and why along with iFilmGroup wish to support and encourage the festival committee in helping the festival to reach out to more filmmakers as well as film lovers to come to see the films being made. This year’s theme is “PERCEPTION vs REALITY”. Costume Designer Janice Ulbrich that worked with Vogue, Linda Lundstrom Inc., Macy’s - Bloomingdale’s and Walt Disney World provided seamstress services through iFilmGroup for m & s Marshall Productions movie “Blue Love”. Wedding scene shot in Port Stanley Ontario. Janice Lucas Ulbrich is a seasoned professional seamstress with over 45 years in the industry, and a graduate of Ryerson in Fashion Design and Merchandising. Janice’s thrilling career has led her to work for notable corporations including Vogue, Linda Lundstrom Inc., Macy’s Bloomingdale and Walt Disney World. Her greatest achievement was working in Animal Kingdom costuming and her daily activities included the dressing of characters for the parades. Additionally, Janice uses her talents sewing and designing for clients including the Winter Ball for the Children’s Hospital. Below are shots with Helena Rose in the wedding dress that she wore in the movie “Blue Love” . Blue Love, the independent dramatic film by m & s Marshall Productions has a theme of “blue” that runs through it on several levels. But the cast and crew of the film also have a red and white streak that runs through a major portion of the primary roles and positions as well as runs throughout the entire cast and crew. That red and white streak is that there is a major portion of them that have attended or are attending Fanshawe College in London, Ontario. It doesn’t take long when you look up and down the cast and crew of the film to see the Fanshawe roots run strong within the film. Four of the top five roles in the film are people who have graduated or are attending Fanshawe. 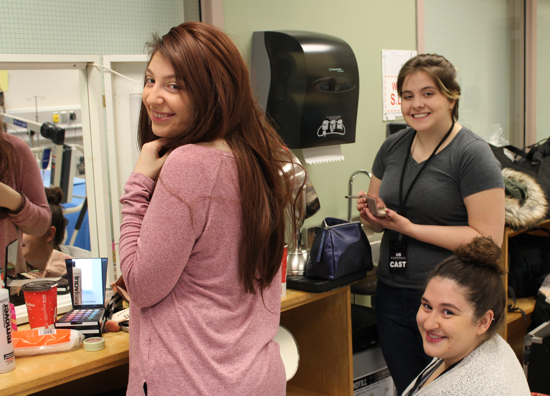 The rest of the cast and crew is sprinkled with Fanshawe connections. All coming from a vast range of programs. From Film Making to Theatre arts, to nursing, and business classes. The Fanshawe legacy is woven into this production on many levels. You look no further than the top to see the Fanshawe connection trickle down. The co-owner of m & s Marshall Production and co-founder of iFilmGroup Matthew Marshall is a graduate of Fanshawe with diploma in “Audio Visual Multi Media Production” and a post graduate certificate in “Broadcast television Digital Editing Applications”. Marshall is the Co-Writer, Co-Producer and Director of Blue Love. His Co-Writing partner and Co-Producer of the film is Helena Rose. She is also plays the lead role of Kaitlyn Butler in the film and an acting coach of iFilmGroup. Helena Rose is a graduate of the Theatre Arts Performance Program at Fanshawe. She is not the only one in the cast that graduated from that program, in fact two of her classmates from the same year as she was are part of the film in Alex Catherine Tremblay and Steven Barber. Tremblay plays Paige the best friend of Kaitlyn. Something that was not hard for Tremblay and Rose to create on screen as they are friends since their time at Fanshawe. Barber plays the role of Dylan Clarke. The cast includes two other current students of the Theatre Arts performance Program. They are Ryan Mason as Kaitlyn’s husband Craig Butler and Marley Cabral that plays a supporting major role of Diamond in the film. The rest of the cast includes a number of other people who have graduated from the Fanshawe Theatre Arts Performance Program or are currently enrolled in it. Including Cheyenne McLean (detective), Kydra Ryan (wedding guest), Samantha Barker (Police Officer), and Amy Curtis (extra and Sound recorder). The cast and crew also includes more past and present Fanshawe students including Dina Jasim (nurse), Zaid Shamsi( Police Officer & Crew), Jessica Fediw (extra in various scenes), Mary Anne Ciuciura (elderly Lady), Aaron Kramers (Crew), Stephen LeGresley (crew), Brandopn Heessel (crew), and Suliman Abuslem (crew). “Fanshawe has some great programs that are very hands on and train the people that come through them to come out into the world to excel in their fields” says Marshall. Dina Jasim got to play the role of a nurse in the film. Something she attended the Fanshawe and Western Program for. She wants to change the lives of others and help people. Through being apart of the productions that Marshall company and iFilmGroup are doing she got to be a part of a production where she play a role of a nurse which is very near and dear to her as well as be a part of something that she enjoys doing in acting. “Several of the film Students have gain experience in making films by being a part of productions with us” Marshall adds. He enjoys being able to work with students and graduates from Fanshawe because he knows he is getting high quality in the people that are attend the school and that come out of the programs. The independent dramatic film Blue Love filmed a full day in London, Ontario of the scenes that are the “backbone” of the film. 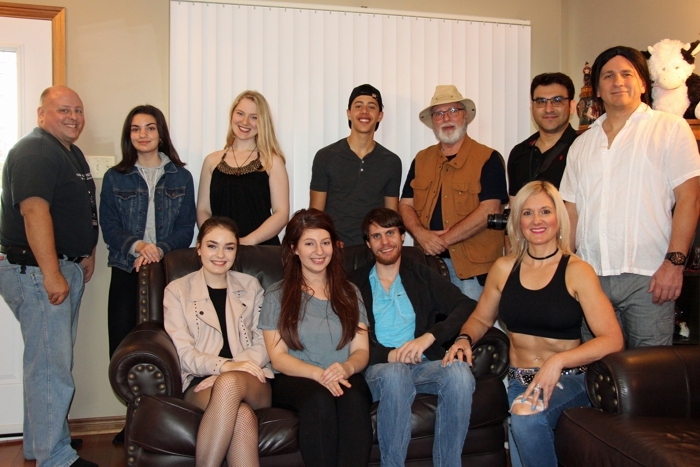 Filming included scenes of the lead character Kaitlyn Butler (Played by actress and iFilmGroup Acting coach Helena Rose) and Dr. Fairbanks (Played by iFilmGroup member Mary Ellen Herder) and took place on a set that was a therapist office. The scenes centre around Kaitlyn who has been court ordered to attend therapy (the reason is revealed in the film) talking to Dr. Fairbanks about her emotional and mental issues due to events in her life. It is in these scenes that the films themes dealing with mental illness, depression, thoughts of suicide and domestic abuse are all explored. Flashback scenes of further explanation and telling the full story are between the scenes in Therapy. The talented pair of actresses in Rose and Herder showed wonderful chemistry during filming of the scenes. The chemistry between them was first seen in original auditions when Herder was reading opposite Rose. As the two of them have got to know each other since casting the chemistry between them when they act opposite each other has grown and shows with the screen magic they make when acting opposite of each other. With the completion of this filming day Blue Love moves into the final stages of production with just a half a dozen more filming days depending on schedules and locations. A day at the end of October will complete another eight scenes for the film. With other dates on the horizon in November and with at least one date in mid-December. Don Hickey, iFilmGroup co-founder was in attendance for the filming with his iFilmGroup partner and other co-founder Matthew Marshall. Marshall owns m & s Marshall Production the company producing Blue Love. Marshall is also the film’s director. He is co-writer and Co-Producer with lead Actress Helena Rose. Rose is a familiar face with iFilmGroup. She is the Acting Coach for the group. As well, Rose has been a part of five previous production associated with Marshall and Hickey and is cast in an upcoming project as well. Including Blue Love that brings her total to seven productions she has acted in and another she was acting coach for. This is Rose’s first time stepping behind the camera to work as a producer and writer of the production. It has given her a new perspective on the process of film making. Rose along with a number of others, both cast and crew have been given an opportunity to grow in their production experience and be mentored in the art of film making through the film. It has also given a voice to many in the cast and crew to work on a film that has themes and a story line on some important issues in society today. A number of people within the cast and crew have talked about the growth they have felt and experienced from working on this project. Marshall feels with performances like what Herder and Rose gave the film will touch and speak to a lot of people. “You will feel for Helena Rose’s character. She has been through a lot. We touch a number of very core pulse themes and topics that are going on in society right now with this film”, says Marshall. After filming is complete the project will move into post production. A release date has not been set yet. iFilmGroup Max Steinberg and his dad, with Don Hickey, meet Chris Potter Actor/Director from CBC TV series Heartland. He shared some experiences of over 30 years from his movie and TV careers. He demonstrated heart-felt emotion when talking of his family. All that listened to Chris speak were moved by his embrace. He certainly is a gentleman that engaged the audience. Sample footage from Heartland WOW’ed the audience. Heartland is a Canadian family drama television series which debuted on CBC on October 14, 2007. The series is based on the Heartland book series by Lauren Brooke. Heartland follows sisters Amy and Lou Fleming, their grandfather Jack Bartlett, and Ty Borden, through the highs and lows of life at the ranch. As of the episode shown on March 29, 2015, Heartland surpassed Street Legal as the longest-running one-hour scripted drama in the history of Canadian television. It celebrated its tenth anniversary in 2016, and Season 10 began airing October 2, 2016. It was announced on March 22, 2017 that Heartland was renewed for Season 11. The season premiered on September 24, 2017. It was announced on April 26, 2018 that the show was renewed for a 12th season. Christopher Jay "Chris" Potter (born August 23, 1960) is a Canadian actor, musician, and pitchman. He is primarily known for his roles on soap operas and prime-time television. Potter is known for his roles as Peter Caine, the son of Kwai Chang Caine (played by David Carradine) on the 1990s crime drama Kung Fu: The Legend Continues, Dr. David Cameron on the first season of Queer as Folk, as the voice of Gambit in the animated X-Men series, and for his recurring role as con-artist Evan Owen on The Young and the Restless. He plays Tim Fleming on the drama Heartland. Saturday, September 29, 2018 marks the closing night theatre show of a program in London Ontario and area that changes the lives of teens that are within the theatre arts program. It is an annually event that the Grand Theatre in London, Ontario presents and is a collaboration production lead by professions but put on by students from the surrounding community. The Grand Theatre’s High School Project is the only theatre program of its kind in North America. It is an acclaimed mentorship program where high school students are taught the craft of theatre production and acting by some of the most outstanding people in the industry from London, Ontario. 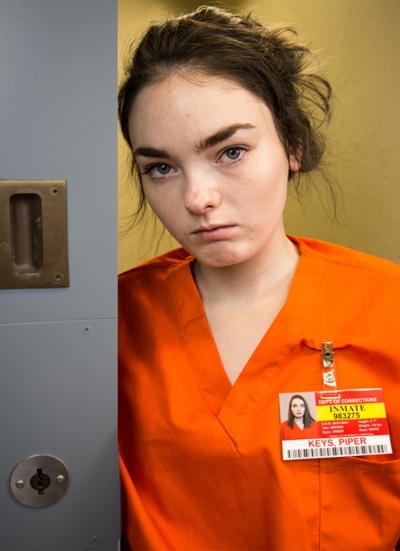 The High School Project offers an exceptional opportunity for students to receive education and training in a work environment of professional theatre. The initiative provides leadership, creativity, and communication skills that serve these students on and off the stage, in every area of their lives. At the end of the journey their learning is culminated in a live production on the Grand’s Spriet Stage. The High School Project or HSP as it is known began in 1998 with West Side Story. Since then the Grand Theatre has produced 34 High School Projects. In 2016 the program celebrated its 20th anniversary with the bestselling Les Miserables: School Edition, which was followed by the hit production Evita last year. This year will mark the first time the HSP brings a new Canadian Musical to the Stage. This year’s selection of a production was Prom Queen: The Musical. The show was not without some controversy within the community. When first released as the production that the Grand was putting forth to be doing for the 2018 edition, the script drew the ire of the London District Catholic School Board and the Thames Valley District School Board and they pulled their funding which left a dent in the project's $250,000 budget. It also marked the first time the two boards haven't contributed to the annual play. Thames Valley School Board Trustee Chair Matt Reid was on record as saying “There are many things in the script that go against the culture and values of our schools” He went on to say “I think the message in the story is very important. The issue is how you portray the facts of the story." Reid also said the play's theme of LGBTQ rights isn't the issue, but rather the language in the script, and how the story portrays school boards, teachers and other adults in a negative light. The community rallied and through various fundraising and donations reach and exceeded the goal for what was needed to put on the play. Grand Theatre artistic director Dennis Garnhum said he chose the play because it allows high school students to play characters their own age in a powerful story of triumph. He is always looking for what’s next and how we grow. He doesn’t want to just keep going through the classic plays. Prom Queen is a brand new Canadian musical set in Ontario based on true fact about what happened when a young high school student innocently said 'I'm taking my boyfriend to prom.'" Prom Queen was originally developed through Sheridan College's Canadian Music Theatre Project (2014). 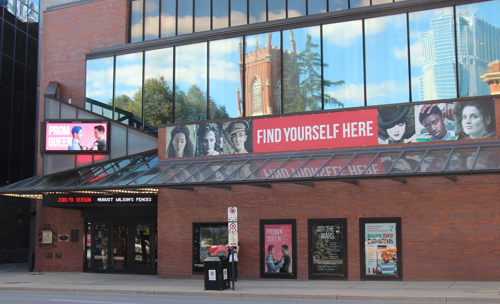 It was development workshopped at Theatre Aquarius in Hamilton, Ontario. (2015). The production had its world premiere at Montreal's Segal Centre for the Performing Arts in Montreal, Quebec in 2016 in a held-over run and was presented at New York's National Alliance of Musical Theater's New Musical Festival. Prom Queen received the 2016 Pechet Musical Award from the Playwrights Guild of Canada and is currently nominated for 4 Montreal English Theatre Awards (META), including for Outstanding New Text (Book and Lyrics) and Outstanding Production. The Montreal Gazette considered the show a champion of human rights, celebrating diversity and shining a glitter ball in the face of intolerance. Broadway.com considers the show "Entertaining, hopeful, and accessible for any audience." Several teens associated with iFilmGroup and the films being made by the group, had applied and auditioned to be part of the High School project production. Two made it to the cast. Both Jessica Ladd and Brooklyn Pritchard were part of the ensemble cast. Jhasna Rivas-Vasquez was part of the crew in the props department. The lead role of the production was played London native Devon Dixon from A.B. Lucas Secondary School who starred as Marc Hall. Brooklyn Pritchard played the role of Chloe Carter one of the students that gets bullied in the short film Malicious Attack that is in post-production. Jessica Ladd played one of the teenagers who make fun of the lead character Kaitlyn Butler (Helena Rose) in Blue Love which is still in principle filming. Jessica is also in consideration for some other upcoming roles with iFilmGroup. Jhasna Rivas-Vasquez is working with the iFilmGroup Team on the tech end. She is interested in gaining more experience in the art of film making with an interest in directing and how a film comes together. The Grand Theatre wants to be committed to providing enriching theatre-going experiences that ignite the imagination and connect learning with creativity. The Grand Theatre's Board of Directors and staff is very thankful to Londoners and all those across the country who came forward to celebrate and support everything that the 2018 High School Project, Prom Queen: The Musical, embraces – diversity, inclusion, and human rights. A community-driven fundraising effort, initiated by David Billson and Rachel Berdan of rTraction in January, generated an overwhelming response. The show received some mixed feelings and reviews but has had a successful run from September 18th to 29th in the Spriet Stage and has given the opportunity to a large group of teens to enhance their skills within theatre and to make and grow friendships that will last a life time. “regardless where peoples thoughts and feels fall on the content of the show, no one can argue with what the High School project does for kids in the community relating to theatre”, Says Matthew Marshall iFilmGroup co-founder and award winning film director. Marshall along with Don Hickey who founded iFilmGroup applaud the Grand Theatre for what they have done with their High School Program as an outlet to mentor and train youth and teens in the theatre industry and theatre production. “I hope that iFilmGroup can have the long term high impact on our youth and teens in film making the same way the High School project has on them within the theatre community”, says Hickey. To date iFilmGroup and its Production Team have mentored over 350 seniors, youth and teenagers in the art of film making, with more joining and being a part of the iFilmGroup program every day. The iFimGroup has several initiatives in the works for seniors and teenagers to gain experience through mentoring with them. They are holding workshops for acting and technical crew. As well, the iFilmGroup team has Accredited Mentoring Programs and Standard Mentoring Programs that high school students and college/university students can be part of. Coming soon will be a Scholarship Program that iFilmGroup is preparing to roll out for the 2018-2019 school year for high School students who are graduating and planning to moving on to post-secondary studies in acting or in a multi Media/visual arts field. “A lot of things are happening at iFilmGroup and we hope that many seniors and teenagers will get involved”, says Hickey. The short film "Struggles Within" was recently released online for a short period of time before it heads to festivals. The short view period of the film was to allow cast and crew as well as the public to see the film prior to it being sent to festivals. The film is a 14 minute telling of a story through almost all music and dance about a girl struggling with depression and contemplating suicide. The creators did not expect the over whelming positive response they have received. The messages have been coming in with people who identify with the film and its message. “The film is a timely story that speaks to what many people in society are struggling with. It is done in a way that words do not fill the story but images and music so the viewer can “feel” the story being told on screen”, says Matthew Marshall the film’s co-producer and Production Manager. Many of the viewers are relating to the subject as they have experienced mental illness and depression in their lives or by someone close to them. The film was a collaboration between IME Films, m & s Marshall Productions and iFilmGroup. Struggles Within is written and directed by Corrinne Wood. When asked about the film, Wood had this to say “mental illness is something really near and dear to my heart, and this film is designed to show an audience who may not be struggling with a mental illness what kind of daily struggles really goes on inside the mind of someone struggling with depression.” The film is an emotional look at one young women’s struggle with depression, her struggles with her inner demons and her choice as to whether she wants to continue to live. Depression is the leading cause of ill health and disability worldwide. More than 300 million people are living with depression, an increase of more than 18% between 2005 and 2015 alone. Yet it is also one of the most stigmatized condition, and misconceptions are very common. Depression affects people of all ages, from all walks of life, in all countries. It causes mental anguish and impacts on people’s ability to carry out even the simplest everyday tasks, with sometimes devastating consequences for relationships with family and friends and the ability to earn a living. In addition, people with depression normally have several of the following symptoms: a loss of energy; a change in appetite; sleeping more or less; anxiety; reduced concentration; indecisiveness; restlessness; feelings of worthlessness, guilt, or hopelessness; and thoughts of self-harm or suicide. At worst, depression can lead to suicide, now the second leading cause of death among 15-29-year olds. The condition of depression and those suffering from depressions surrounds and affects the m & s Marshall and IME Film teams. Also a number of iFilmGroup members struggle with anxiety, depression and mental illness. “The issue hits close to home for many of us” says Don Hickey, iFilmGroup co-founder. “Friends, Family and those around many of us deal with depression every day” says Marshall. It is why Marshall, Hickey, m & s Marshall Productions and the iFilmGroup teamed up with IME films to undertake making this film. The film’s lead dancer who plays the role of “The Girl”, Katie Ostojic feels dancing in the film was a wonderful opportunity to do what she loves the most, to dance. “Being part of this film is an opportunity to inspire others, especially youth” says Ostojic when talking about her role in the film. She goes on to say, “The story about overcoming demons and finding hope Is one I know well, and It’s an honour for me to tell this story through the art dance. Hope changes everything”. “I love this film! I relate on so many levels. Thank you for making it and opening up the conversation about mental Illness” – Tanya C.
“Great story. My wife suffers with depression and we both can relate to this film on so many levels. Great Job.” – Mark G.
“This film blew my mind. The team presented the issue of mental illness through the mind of someone who suffers from it, in a very real way. Awesome job.” – Megan T.
“Thank you for making a film that open the doors to discussion on the topic of depression” – Jamie T.
Struggles Within presents the struggles that someone with mental illness deals with. I love the images. You had me gripping my seat and cheering for ‘the Girl’ to defeat Depression - Emma L.
“A gripping story that so many people can relate to.” – Stacey R.
“I was moved by the telling of this story through dance and images. You touched me with the story. Thank you for telling a story that open doors to discuss the topic of depression and break down stigmas related to the issue.” – Angela B. The film will be up online for viewing a bit longer and then will be entered into film festivals for the next year. Following that the film’s director Corrinne Wood would like to give it to various community organizations for them to have and use in sharing the story of what it is like to struggle with depression and with inner demons. The date was set, the casting call for extras were posted, and the numbers exceeded movie director's expectations for filming. 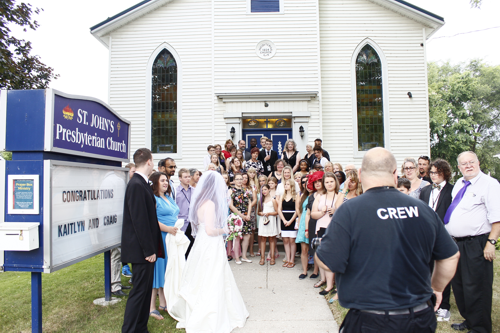 iFilmGroup and m & s Marshall Productions hosted it’s very large filming date at St John’s Presbyterian Church on Saturday July 14th when it filmed the big wedding scene of Kaitlyn and Craig for the film “Blue Love”. Matthew Marshall the film’s director declared the event an overall success as it went off without a hitch. It ended up being a little smaller than originally planned but everyone in attendance enjoyed themselves and had a great time. 84 people had confirmed to be extra’s and wedding guest for the filming on the scene in Port Stanley but when the date came the final numbers of those in attendance were a little lower due to some illnesses going around. 73 people was the final total of those who attended the filming date and participated in the filming for Blue Love. The casting team for the film received a number of sick calls in the last few days before filming. “We had a few with strep throat that is going around and a number of people that were missing were just under the weather for various reasons. It may have been a little smaller number but it did not affect the overall end product. Just tighten the shot up a little”, says Matthew Marshall. Along with being the film’s director Marshall is also the films co-producer, as well as he is the co- owner of m & s Marshall Productions and the co-founder of iFilmGroup. Both companies are working together on the film with Marshall Productions taking the lead. IFilmGroup’s other co-founder Don Hickey was in attendance for filming. Both were very pleased with the outcome. Marshall is especially pleased with the footage they got from the wedding scene as well as some other scenes that were filmed on the same day. “The day is very much declared a success” says Marshall. The Wedding Scene is a flash back in the film to the marriage of the lead character Kaitlyn Butler to her love of her life Craig. 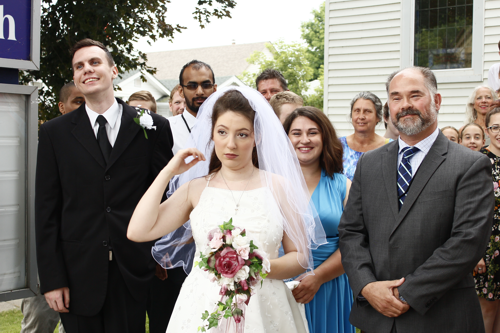 The scene featured iFilmGroup acting coach, Helena Rose, as the bride Kaitlyn. As well as lead, Rose is also the co-producer and co-writer of the film. It has been an opportunity for Helena to learn more about the production aspect of film. Marshall says, “It has exposed her to how a full production comes together from a technical perspective.” The groom, Craig is played by Ryan Mason. 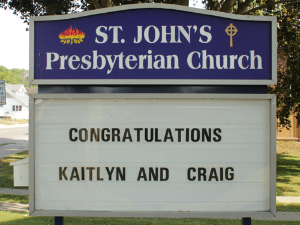 St John’s Presbyterian Church in Port Stanley even got into the spirit of the filming changing their sign to read “Congratulations Kaitlyn and Craig”. St John’s member and elder as well co-owner of m & s Marshall Productions Sharon Marshall had this to say, “The sign was a great way to create curiosity in the community and also was way to tell extra’s that was the location”. Marshall has, had a casting call out for extra’s for over a month looking for extra’s for the film and got a very large response from the call. “This would have to be my biggest response I have ever got for a call for extras” says Marshall. He had 174 people that showed original interest in being an extra. That was more than double what would have fit in the church. But through time and the process the number slowly got smaller. 60 people who applied but did not message or respond back to messages that were sent to them. Another 30 were very interested and responded but were unable to come on the date due to conflicts or prior commitments. Thus bringing the number down to the 84 which in the end due to illness became the 73 that attended. “It was a great day and everyone had a good time” says Marshall. Along with the wedding scene Marshall and his team also shot a few other scenes that will be part of the movie at the location. The film will continue to film through the rest of July through until fall. The next filming date coming up is Tuesday July 17th in Chatham where an iFilmGroup member will be featured in special effects makeup. With the completion of the scenes in Port Stanley it brings to a close the opportunities for extras in Blue Love. However, Marshall and Hickey have plans in the works that will offer more opportunities for new and current iFilmGroup members. Preparation has started for casting and filming the short film, “Not Ready”, written by Hickey. Workshops and events are being planned for the fall as well. Al Sayyid in "Accredited Mentoring Program"
According to an article in Variety in April 2017 it mentioned that a recent study commissioned by the Doha Film Institute showed that Arabic independent films are twice as likely to be directed by a woman. In fact, 26% of independent film directors in the region are female, “much more than directors of studio films in the West,” it noted. Only 4% of filmmakers are female in Hollywood, according to research by the USC Annenberg School for Communication and Journalism. That would have not been the story one would have assumed was to be written for Yasmine Al Sayyid. A young Muslim woman who has been travelling between Canada and the Middle East learning the craft of film making, specifically directing. “Growing up in the Middle East I would have never imagined the opportunities that I am embarking on now. To be on the verge of directing a film, let alone a film about my culture and background. It is unbelievable,” says Al Sayyid. Yasmine looks up to woman who have forge the path before her like Saudi Arabian film director Haifaa al-Mansour who is one of the country's best-known and most controversial directors, and the first female Saudi filmmaker. American-Egyptian Jehane Noujaim’s film "The Square", earning her an Oscar nomination. Film Making is a growing industry for women from the Middle East. “The Arab world need to see their own stories on screen” she says “to be able to see a film about your own life, and the kind of people you know and hear your own accent, it’s equally important. It tells you your life is worthy too, your small stories count, your life counts. Cinema is not something for people in other places, “ Al Sayyid goes on to say. She draws inspiration from the things she has seen in her home country as well as things she has seen in seeing world events. All of this she has gather together and has been working on her film making skills through school and mentoring with Award winning director Matthew Marshall and the iFilmGroup. “I am so very thankful to Mr. Matthew Marshall, Mr. Don Hickey and the iFilmGroup for the wonderful opportunity to work with them and to be mentored in their Accredited Mentoring Program” says Al Sayyid about her opportunity to be mentored through the iFilmGroup "Accredited Mentoring Program". Marshall is impressed with her drive and determination and is sure that she will be making films in the very near future about topics and issues that are dear to her heart. “This is the kind of thing that we want to do with iFilmGroup” says Marshall. He feels it’s important to pass along knowledge and experience so that the next generation can carry on the craft of film making. Al Sayyid is not going to waste the knowledge she has gained. “ I intend to take all that I have learned and continue to advance my craft or film making and learn about all aspects of film making and perfect my skills as a filmmaker”, Al Sayyid says. For Marshall and Hickey they continue to look forward to the new people on the horizon that will be part of their mentoring programs with iFilmGroup. Movie Set of "Blue Love"
A number of members of iFilmGroup were part of filming for m & s Marshall Production's newest production "Blue Love" at the Elgin General Hospital in St. Thomas on Saturday May 12th. What was extra fitting about filming on this date was that the week on May 6th to 12th was National Nurses Week. This week is set aside to celebrate nurses and raise awareness of the important role nurses play in society. Saturday May 12th is the end of the week and this day is declared National Nurses' Day. May 12th and is also Florence Nightingale’s Birthday. Florence Nightingale was a trailblazing figure in nursing who greatly affected 19th- and 20th-century policies around proper care. Her writings sparked worldwide health care reform, and in 1860 she established St. Thomas' Hospital and the Nightingale Training School for Nurses. The connection of Nightingale’s birthday and the end of Nurses week and the fact that she established the St. Thomas Hospital in England. 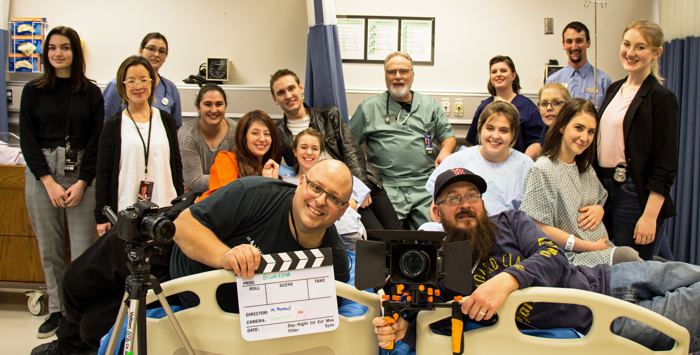 All played into the perfect setting for the m & s Marshall crew to be in the Elgin General Hospital in St. Thomas, Ontario, Canada to film for "Blue Love" scenes that took place in a hospital and involved nurses on the day set aside for them. 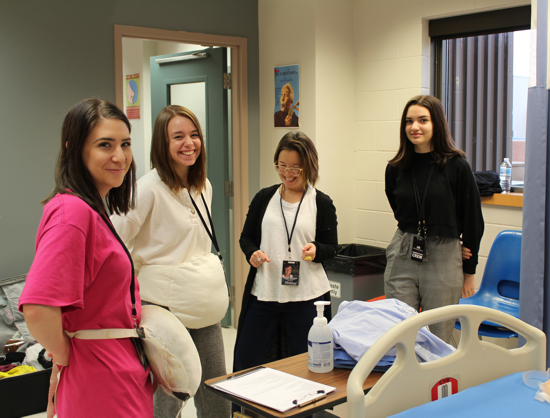 It was even special that the cast had nurses, PSW's, nurse students and other related fields being part of the people playing the roles of nurses in the film. “It was an amazing day with some amazingly talented people who helped create some truly awesome shots that will look "out of this world" when they are edited.” says Blue Love director and iFilmGroup co-founder Matthew Marshall. Marshall is also the co-owner of m & s Marshall Productions and he really loved that they got to do those scenes on the day that is set aside for recognizing nurses. “Those kind of things are special to me. I have a lot of respect for the jobs nurses do. I know a lot of family and friends who are either retired nurses or currently nurses. They are a special and important part of society”, Marshall goes on to say. 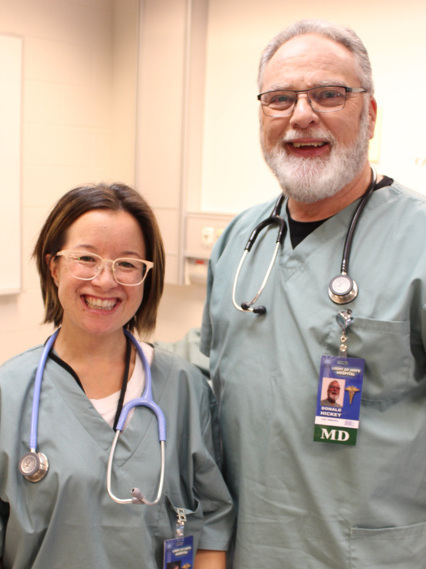 Marshall and Don Hickey (who is the other co-founder of iFilmGroup) can relate to how special nurses are as they both can speak of personal experiences where nurses have taken care of them and or members of their families. “They do a special job and we at iFilmGroup are very grateful for the job they do”, says Hickey. 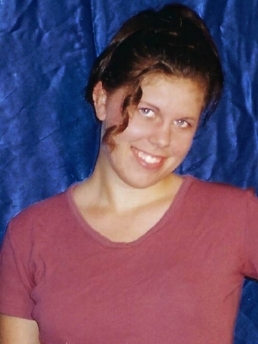 "Blue Love" centers on the main character of Kaitlyn Butler. The role is played by iFilmGroup acting coach and actress Helena Rose. Her character plays a nurse in the film. The scenes also included a Medical Clinic scene with a number of extras that featured a number of iFilmGroup youth and young adults. As well as some iFilmGroup members who are seniors. The extras in the clinic scene helped bring the scene to life. Although they were extras, a number of them were playing double roles in different scenes as extras playing kids with injuries or who were sick or there for various reasons. “It looked and felt like a real clinic with people waiting to see a doctor. All the extras were great”, says Marshall. Over all he was very pleased with the day and the footage that was captured. More scenes will be filmed in the coming weeks to months as production continues with filming happening in and around London / St Thomas area. Within those scene a number of the iFilmGroup members were involved in this filming day as well as others will be involved in future scenes. “That’s part of what iFilmGroup does, which is nurture talent and bring the actors along in the process of the art of filming and we help them to develop into better performers and crew to further themselves in their acting endeavors”, says Hickey. Strathroy native and actress Maysee McLean has left a big impression with the m & s Marshall Productions and iFilmGroup. To the point it has landed her three roles in three different productions. Miss McLean was part of the auditions held on Jan 27th in London Ontario. She could have never anticipated what would come out of those auditions and the audition team was not fully prepared for what McLean would bring to the Audition. “When I saw her original audition video, I knew she had talent,” says Matthew Marshall the co-owner of m & s Marshall Productions and one of the founders of iFilmGroup. But Marshall and the rest of the casting team were blown away by what Maysee brought to the audition in her talent. “I set up a number of elements to her auditions to feel out a gut feeling I had about her and she knocked each element out of the park and blew each member of the audition team away,” says Marshall about her auditions. There was little doubt in discussions after the audition that McLean was really good and needed to be part of some of the upcoming productions. Her performance was so good it lead Marshall and his co-writer Helena Rose to change a character within the script of Blue Love into a bigger role for McLean to play. That role is the role of Piper Keys. A character that we originally see with several characters who are part of a group of prostitutes in which the husband of the main character has got involved with. Later we see Piper Keys connected with a group of street kids that the main character Kaitlyn runs into. Marshall also has decided to cast Miss McLean in some more shots that are being done for the short film about depression "Struggles Within". Marshall along with the production team from the film did some shooting of some new dramatic footage to add to the original film to enhance and better explain the issue of depression told in the film. “Part of her audition really showed her strength in acting out a dramatic situation with no words about depression. I think her skills and talents will enhance the production by adding some shots with her in it. The final role she has been cast in is the iFilmGroup promotional video in which the group is doing to explain what they are doing in making inter-generational films with youth/teens and seniors. From McLean’s perspective she is very overjoyed for all the opportunities that she has been given. “I’m so excited to be a part of upcoming projects with m and s production as well as iFilmGroup. I look forward to working with the team. These three roles are such an amazing opportunity to learn and grow as an actress,” says Mclean. In the last year or so McLean has been striving to broaden her experience. Which included attending the May 2017 CMTC (Canadian Modeling Talent Conference) in Toronto. CMTC was developed in 1991 to help create the right time and place for models/talent to be educated and showcased. McLean is a talented singer who has sang in a number of recitals. She is also not new to acting as she has a fair bit of home town experience as well as some work In front of the camera. She has had a number of roles with the Youth Performing Arts in Strathroy. Including she has been an Oompa Loompa, in Willy Wonka. She was in all the scenes singing and dancing for "Gleek". She played the Big Bad Wolf in "Into the Woods", “Kaa” the snake in "Jungle Book" to name her highlight roles. She played Mama Ogre in "Shrek Jr", Doo Whop girl in "Little Shop of Horrors", Sandy in a Jr version of "Grease" and the female lead Molly in "Peter and the Starcatcher". She has been part of three TV commercials; "Sharky's Cuts for Kids", "Progressive Countertops", and 2016- "Boys and Girls Club of London". London, Ontario native and award winning actress Marley Cabral announced via social media that she accepted the offer to attend Fanshawe College’s Theatre Arts-Performance Program at downtown campus in September 2018. This is yet another step for Cabral in pursuing her love and passion of acting. A path that was inspired by the process of working with award winning director Matthew Marshall when Cabral got the opportunity to play the lead role of “Emma” in Marshall’s short film “Tuned In”. A role that she had to admit “I related to on a number of levels”, says Cabral. The role of Emma brought some challenges to Cabral in pushing through the process of making the film. Especially since the role of Emma was the lead character and was in just about every scene. "Tuned In’s" director Matthew Marshall fully understands how tough making a film is. “Making a film or being part of a theatre show is not for the weak at heart. Regardless if you’re acting or behind the scenes“, says Marshall. But the reward on the other side for Cabral, lead to her capturing five “Best Actress” awards as well as several nominations for her performance. Including prestigious nominations in two big festivals. One being a nomination at the MIC International Awards Gala for Youth for Best Actress in a short film (Age 16 Category) for her portrayal of Emma. Although she did not win, being nominated was a huge honour and tribute to her performance. The second big nomination for the role of Emma was at the International Christian Film Festival where she went up against the best in the world for “Best Lead Actress”. Again she did not win, but the nomination against the best in the world was a big honour. She followed up her role of Emma with a second production with Marshall where she played the role of “Brittany” in his short film, “Malicious Attack” dealing with Bullying. It was another role that she related to and was able to expand her expression of herself through the role. The film is to be released later in 2018. Cabral feels these two films were a great experience for her and allowed her to develop her skills as an actor and be mentored by some amazing fellow cast members. “How do you put into words about a process that changes your life and helps to define what you want to do in the future? These two films changed my life in so many ways through the life lessons I learned and skills of acting and film production that I gain through them” says Cabral. “They set me on my way of knowing what I wanted to do”, adds Cabral. What she wants to do is act and getting into the Fanshawe Theatre Arts – Performance program is that next step for her to learn how to take her acting to the next level. “I am so proud of Marley and her taking this next step in her acting career”, says Marshall. “This will do nothing but enhance her immense acting talent she already has. The Fanshawe Theatre Arts-performance program is amazing. I have worked with a number of people that have come out of that program”, adds Marshall. Cabral feels a number of things that she took away from the process of the two films will help her with this newest adventure of post-secondary studies. But one thing stood out more than the rest that she really feels will help her. “From making the films, I took away from it all that no matter what when things get hard you have to push through them to get the amazing outcome of all the hard work you have put towards it”, says Cabral. That is something that Marshall feels will serve her well. Before she starts the program in September, Cabral will be a part of one more of Marshall’s productions as she will play the role of “Diamond” in the newest dramatic film by m & s Marshall Productions called “Blue Love”. Marley is passionate about her craft of acting. She cut her teeth walking the boards of London Ontario’s very own Original Kids Theatre Productions. Over the past few years she been a part of a number of Original Kids Theatre Company Productions including “Chicago”, “Green Girl in "Shout", Billy in "Honk", Daughter in "Pirates of Penzance Jr", and Lulu in "The Best Haunted House Ever", Camilla in "Starmites" and Women #1 in "Trojan Women". She has also been a part of a TV series and other films outside of the ones done with Marshall. She has played a student in the short film “Crucified” and also a student in the TV series “Kids Town”. Cabral is entering into a well-respected acting program in the Fanshawe Theatre Arts-Performance. The program is well known for preparing those that graduate for a career in theatre, film and television. The program is also an excellent preparation for drama teachers and entrepreneurs. The two-year conservatory program will give those taking it a practical experience in acting for the stage, mask work, play analysis, improv, and acting for the camera. Those in the program also take other specialized master classes and will work with professional artists on a graduating project that will come together as a professional production. Each student is guided through a process of discovering a method of acting that brings out their full potential and they emerge with a deep understanding of Shakespeare, theatre history, movement for actors, and the business of acting. Those that graduate emerge with a strong foundation for launching a professional career. Helena Rose an iFilmGroup acting coach and the actress playing the lead role of Kaitlyn in "Blue Love", as well as having been cast in a number of other productions with the key plays of the iFilmGroup is a graduate of the program. 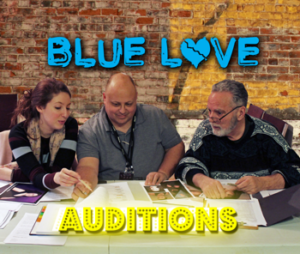 As is other "Blue Love" cast members "Alex Tremblay" and "Steven Treavor". Now Cabral prepares for this next adventure in her acting journey with this two year program armed with all her past experience and prepared for the new challenges that she faces. Cabral is excited to see what this new chapter in her life brings and how it will allow her to grow and stretch as an actress. “I can’t wait to get into the program and learn how to take my acting to the next level. I’m so looking forward to it”, says Cabral. As the lights dim, the curtain will rise and Cabral will prepare to centre stage, to breathe life into her dream. The lights will come up and she will begin her studies for a career on the stage or screen in the state of the art facilities in the vibrant downtown of London, Ontario. Marley Cabral take your cue and allow your dream to soar. iFilmGroup and m & s Marshall Productions congratulates you on taking this next step and wishes you all the best. “Break a Leg”! Steinberg Cast in "Sword in the Stone"
Max Steinberg who has been a part of several films associated with iFilmGroup and m & s Marshall Productions is setting out on his biggest acting quest yet. He is honoured to be part of the multi award winning screenplay, "1000 - Sword in the Stone" filming during the Summer of 2018. 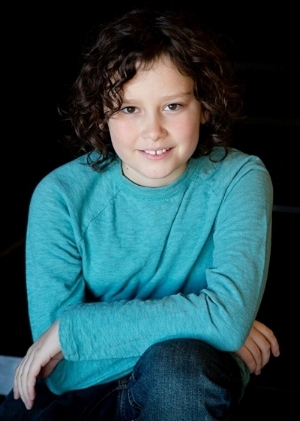 Max’s previous roles included Young Ryder in "Black Donnelly’s", Newsboy in "Red Ryder", Liam in "Malicious Attack", Chris in "Summer of Discovery". Max has a busy 2018 schedule. As he will be part of iFilmGroup’s promo video and is also scheduled to be one of the Basketball teens in Matthew Marshall’s newest film "Blue Love". Later in 2018 he will be part of the cast IN the short film "Not Ready". An amazingly talented group of grade four to eight’s from LCA (London Christian Academy) presented "Fiddler on the Roof Jr." during late April. From the opening lighting dim, the young stars of the show began to shine. The vision of the show started two years ago, as the creative minds on staff at the school started to day dream what "Fiddler on the Roof Jr." might look like when presented at LCA. That vision did not disappoint. From the opening fiddle playing the “Fiddler on the Roof” Lana Luka to the opening number of “Tradition”. The cast, and the production lived up to the long history of the outstanding play. This very talented cast lead by a familiar face to m & s Marshall Production and iFilmGroup.org was Zachary Wilson who played the role of Tevye. Zachary has been a part of the films "Malicious Attack" as a student and "Summer of Discovery" as Rob. Wilson is also to be a part of the newest m & s Marshall Production "Blue Love". Along with that project Wilson will be part of upcoming filming and workshops with the iFilmGroup.org which will be happening in late May. The telling of this classic story of Tevye, a poor dairyman and his five daughters in a little village of Anatevka Czarist Russia surrounded by the tight-knit Jewish Community blends the old and tradition with the changing of times in a changing world. It is a story that never gets old and being told by a young talented group of students proves it’s lasting endurance through the generations. “it certainly was a talented group of cast and crew from LCA who brought this together and told the story on stage in a very riveting way” says iFilmGroup.org co-founder and m & s Marshall productions co-owner Matthew Marshall. He goes on to say “I have worked on many films and theatre productions in my over twenty five year career, it is not lost on me the amount of time and dedication it takes to pull together a show of this size with a cast size as Fiddler is. I am very much aware of the extreme amount of work and dedication that goes into rehearsals to the end performances. Especially a live show. This group of students, teachers and parents did an amazing job” says Marshall. He speaks from his over 25 years of making films with over 300 youth teens and being an award winning film director at festivals around the world. “I think the kid’s teachers and parents deserve a lot of praise and thanks for all that they have given to make a project like this come to a successful show point. Marshall as well as the entire m & s Marshall Production and iFilmGroup.org teams wish to congratulate LCA on the wonderful and successful presentation of the classic story of "Fiddler on the Roof". Helena is a big part of the creative team of the 1 hr long dramatic film "Blue Love" by m & s Marshall Productions where she plays the lead role of Kaitlyn Butler as well as being the co-producer and co-writer of the film. She was already been the dramatic acting coach on the short film "Struggles Within". She has been a part of a number of short films. Credits in those films include: Whitney in "In Limbo", Alicia Turner in "Malicious Attack", Candy in "Summer of Discover", Medical Attendant in "Ronny’s Bench", Karla in "Zenno", a Towns Women in "Black Donnellys", a student and radio Announcer #2; in "Tuned In". Stage roles included Been Wendla in "Spring Awakening", Titania in "A Midsummer Nights Dream" and Mother in "Byrthrite". “I very much look forward to working with her both with iFilmGroup as well as with me on Blue Love” says Matthew Marshall a co-founder of iFilmGroup and the director, co-producer and co-writer of Blue Love. Marshall feels this is only the beginning of hearing about this fabulous actress. Award winning director Matthew Marshall, who is the co-founder of iFilmGroup and co-owner of m & s Marshall Productions is one of the 2018 Western Smartphone Film Festival Judges. Marshall along with several other industry professionals from London Ontario will make up the panel that will judge the top ten films submitted to the festival which will be held on Saturday February 10th on the Western Campus. The Western Smartphone Film Festival is a student-run organization at Western University and is focused on developing youth in the field of film and entertainment by means of an annual smartphone short film festival. With a focus on inclusivity and garnishing Canada's diverse and talented student population. The festival uses the smartphone as a platform to allow a broad range of students to explore their creativity and further fuel their passion for the arts.